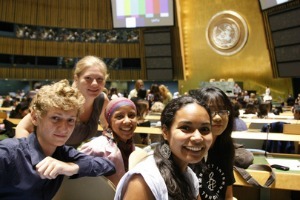 Following the UN International Year of Youth Culmination festivities on 11 August, the International Youth Day was celebrated around the world on 12 August. 2011 marked the event’s 25th anniversary, and in common with previous occasions, an important theme was adopted as a banner for the Day. This year, young people were encouraged to “Change Your World”, a deliberately ambitious goal underscoring the energy and potential of youth. Creating connections through dialogue is a great strength of modern youth culture, and social media in particular has been used to empower youth and raise awareness. The UN “Change Your World” campaign has invited young people to post suggestions about how to make the world a better place. The proposal which garners the most votes will be presented at the next Global Changemakers Summit, a British Council sponsored forum for youth leadership. The importance of collaboration across nations and generations is also essential to meaningful and ongoing change. At the UN High-level meeting on Youth in July, it was stressed that young people must be recognized as active partners in development. This cooperation not only means that public and private sectors must work to support youth, but that young people themselves invest in society through active involvement.